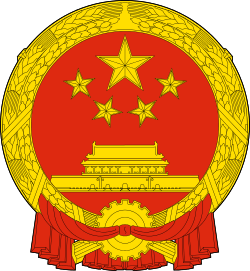 The Chinese economic reform (simplified Chinese: 改革开放; traditional Chinese: 改革開放; pinyin: Gǎigé kāifàng; literally: "reform and opening-up") refers to the program of economic reforms termed "Socialism with Chinese characteristics" in the People's Republic of China (PRC) that was started in December 1978 by reformists within the Communist Party of China, led by Deng Xiaoping. 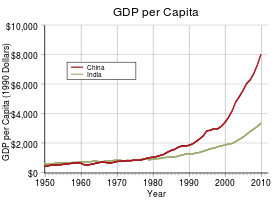 China had one of the world's largest and most advanced economies prior to the nineteenth century. In the 18th century, Adam Smith claimed China had long been one of the richest, that is, one of the most fertile, best cultivated, most industrious, most prosperous and most urbanized countries in the world. The economy stagnated beginning in the 16th century and even declined in absolute terms in the nineteenth and much of the twentieth century, with a brief recovery in the 1930s. Economic reforms introducing market principles began in 1978 and were carried out in two stages. The first stage, in the late 1970s and early 1980s, involved the decollectivization of agriculture, the opening up of the country to foreign investment, and permission for entrepreneurs to start businesses. However, most industry remained state-owned. The second stage of reform, in the late 1980s and 1990s, involved the privatization and contracting out of much state-owned industry and the lifting of price controls, protectionist policies, and regulations, although state monopolies in sectors such as banking and petroleum remained. The private sector grew remarkably, accounting for as much as 70 percent of China gross domestic product by 2005. From 1978 until 2013, unprecedented growth occurred, with the economy increasing by 9.5% a year. The conservative Hu-Wen Administration more heavily regulated and controlled the economy after 2005, reversing some reforms. The success of China's economic policies and the manner of their implementation has resulted in immense changes in Chinese society. Large-scale government planning programs alongside market characteristics have minimized poverty, while incomes and income inequality have increased, leading to a backlash led by the New Left. In the academic scene, scholars have debated the reason for the success of the Chinese "dual-track" economy, and have compared them to attempts to reform socialism in the Eastern Bloc and the Soviet Union; as well as the growth of other developing economies. During the 1930s, China developed a modern industrial sector, which stimulated modest but significant economic growth. Before the collapse of international trade that followed the onset of the Great Depression, China’s share of world trade and its ratio of foreign trade to GDP achieved levels that were not regained for over sixty years. The economy was heavily disrupted by the war against Japan and the Chinese Civil War from 1937 to 1949, after which the victorious communists installed a planned economy. Afterwards, the economy largely stagnated and was disrupted by the Great Leap Forward famine which killed between 30 and 40 million people, and the purges of the Cultural Revolution further disrupted the economy. Urban Chinese citizens experienced virtually no increase in living standards from 1957 onwards, and rural Chinese had no better living standards in the 1970s than the 1930s. One study noted that average pay levels in the catering sector exceeded wages in higher education. Famous billboard of Deng in Shenzhen, one of the most successful Special Economic Zones created by his reforms. Deng's first reforms began in agriculture, a sector long neglected by the Communist Party. By the late 1970s, food supplies and production had become so deficient that government officials were warning that China was about to repeat the "disaster of 1959", the famines which killed tens of millions during the Great Leap Forward. Deng responded by decollectivizing agriculture and emphasizing the household-responsibility system, which divided the land of the People's communes into private plots. Farmers were able to keep the land's output after paying a share to the state. This move increased agricultural production, increased the living standards of hundreds of millions of farmers and stimulated rural industry. The bottom-up approach of the reforms promoted by Deng, in contrast to the top-down approach of the perestroika in the former Soviet Union, is considered an important factor contributing to the success of China’s economic transition. In the 1990s, Deng forced many of the conservative elders such as Chen Yun into retirement, allowing radical reforms to be carried out. Despite Deng's death in 1997, reforms continued under his handpicked successors, Jiang Zemin and Zhu Rongji, who were ardent reformers. In 1997 and 1998, large-scale privatization occurred, in which all state enterprises, except a few large monopolies, were liquidated and their assets sold to private investors. Between 2001 and 2004, the number of state-owned enterprises decreased by 48 percent. During the same period, Jiang and Zhu also reduced tariffs, trade barriers, and regulations; reformed the banking system; dismantled much of the Mao-era social welfare system; forced the PLA to divest itself of military-run businesses; reduced inflation; and joined the World Trade Organization. These moves invoked discontent among some groups, especially laid-off workers of state enterprises that had been privatized. The conservative Hu-Wen Administration began to reverse some of Deng Xiaoping's reforms in 2005. Observers note that the government adopted more egalitarian and populist policies. It increased subsidies and control over the health care sector, halted privatization, and adopted a loose monetary policy, which led to the formation of a U.S.-style property bubble in which property prices tripled. The privileged state sector was the primary recipient of government investment, which under the new administration, promoted the rise of large "national champions" which could compete with large foreign corporations. 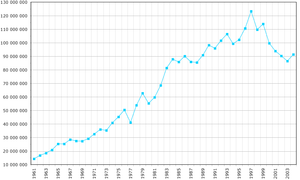 China's nominal GDP trend from 1952 to 2005. Note the rapid increase since reform in the late 1970s. 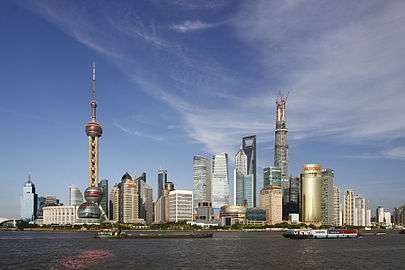 China is widely seen as an engine of world and regional growth. Surges in Chinese demand account for 50, 44 and 66 percent of export growth of Hong Kong, Japan and Taiwan respectively, and China's trade deficit with the rest of East Asia helped to revive the economies of Japan and Southeast Asia. Asian leaders view China's economic growth as an "engine of growth for all Asia". A more fundamental transformation was the economy's growing adoption of cash crops instead of just growing rice and grain. Vegetable and meat production increased to the point that Chinese agricultural production was adding the equivalent of California’s vegetable industry every two years. Growth in the sector slowed after 1984, with agriculture falling from 40% of GDP to 16%; however, increases in agricultural productivity allowed workers to be released for work in industry and services, while simultaneously increasing agricultural production. Trade in agriculture was also liberalized and China became an exporter of food, a great contrast to its previous famines and shortages. Scholars find that China has attained a degree of openness that is unprecedented among large and populous nations, with competition from foreign goods in almost every sector of the economy. Foreign investment helped to greatly increase quality, knowledge and standards, especially in heavy industry. China's experience supports the assertion that globalization greatly increases wealth for poor countries. Throughout the reform period, the government reduced tariffs and other trade barriers, with the overall tariff rate falling from 56% to 15%. By 2001, less than 40% of imports were subject to tariffs and only 9 percent of import were subject to licensing and import quotas. Even during the early reform era, protectionist policies were often circumvented by smuggling. When China joined the WTO, it agreed to considerably harsher conditions than other developing countries. Trade has increased from under 10% of GDP to 64% of GDP over the same period. China is considered the most open large country; By 2005, China’s average statutory tariff on industrial products was 8.9 percent. For Argentina, Brazil, India, and Indonesia, the respective percentage figures are 30.9, 27.0, 32.4, and 36.9 percent. China's success is also due to the export-led growth strategy used successfully by the Four Asian Tigers beginning with Japan in the 1960s–1970s and other Newly industrialized counties. The government retains monopolies in several sectors, such as petroleum and banking. The recent reversal of some reforms have left some observers dubbing 2008 the "third anniversary of the end of reforms". Nevertheless, observers believe that China's economy can continue growing at rates of 6–8 percent until 2025, though a reduction in state intervention is considered to be necessary for sustained growth. Other criticisms focus on the effects of rapid industrialization on public health and the environment. However, scholars believe that public health issues are unlikely to become major obstacles to the growth of China’s economy during the coming decades, and studies have shown that air quality and other environmental measures in China are better than those in developed countries, such as the United States and Japan, at the same level of development. ↑ Dahlman, Carl J; Aubert, Jean-Eric. China and the Knowledge Economy: Seizing the 21st century. WBI Development Studies. World Bank Publications. Accessed January 30, 2008. ↑ Maddison, Angus (2007): "Contours of the World Economy, 1–2030 AD. Essays in Macro-Economic History", Oxford University Press, ISBN 978-0-19-922721-1, p. 382, table A.7. ↑ Engardio, Peter (21 August 2005). "'China Is a Private-Sector Economy'". Bloomberg Businessweek. 1 2 3 4 Scissors, Derek (May–June 2009). "Deng Undone: The Costs of Halting Market Reform in China". Foreign Affairs. 88 (3). ↑ Schoenleber, H. (23 September 2006). "China's Private Economy Grows Up". 8km.de. ↑ "China's New Healthcare could cover millions more", Time magazine. ↑ Chovanec, Patrick (2009-06-08). "China's Real Estate Riddle". Far East Economic Review. Retrieved 13 March 2010. ↑ "China poised to be world’s largest auto market". MSNBC. 2009-02-04. ↑ Sharma, Shalendra D. (Winter–Spring 2007). "China's Economic Transformation". Global Dialogue. 9 (1–2). ↑ Dorn, James A. (Fall 2002). "Economic Development and Freedom: The Legacy of Peter Bauer" (PDF). Cato Journal. Cato Institute. 22 (2). ↑ Remnick, David (January–February 1997). "Can Russia Change?". Foreign Affairs. 76 (1).